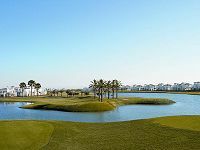 Mar Menor Residences overlook the Mar Menor Village Golf Course, and allow golfers the living space to feel at home, making this the perfect destination for a short or long-stay golfing getaway. Golf Packages at Mar Menor include complimentary golf transfers to each of the 6 Nicklaus Design courses all located within 45 minutes of the Residences. 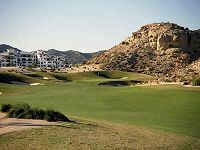 The Murcia Golf Trail, includes the European Seniors Tour venue, El Valle, and Alhama Signature Golf – arguably the finest of the Nicklaus courses in Murcia. Upgrades to Unlimited Golf programmes are available on request. Groups of 8+ enjoy Free Airport Transfers and Meal Deals depending on length of stay. Daily Breakfast is served just a 5 minute walk away at the Club House. The 4 specialist restaurants at The InterContinental Hotel are available for Residence guests. Additional restaurants, nightlife and a supermarket are available on The Boulevard in Mar Menor Village, just a short stroll from the Residences. Semi All-Inclusive upgrades are also available at Mar Menor on request. Guests of Mar Menor Residences enjoy direct access to outdoor pool open in summer months. The Spa and indoor pool at InterContinental Hotel are available with a supplement. Mar Menor Residences are located 10 minutes from Murcia Airport and 1 hour from Alicante Airport. Listed Golf Package prices at Mar Menor Residences include daily breakfast at the Clubhouse. Booking Terms: Supplement payable per person per night for Fontana Di Pietra & AGNI. Surcharge of €5 per night payable for Nomad and Mizu Restaurants. 3-Course evening meal included. Drinks not included. Listed Golf Package prices at Mar Menor Residences already include a Discount of 10% for booking at least 60 days before arrival. Offer Conditions: A supplement may apply for late bookings. Listed Package Prices: Listed Golf Package prices apply for booking at least 60 days before arrival. Group Offer applies to Group of 8 persons sharing 2x2-bedroom apartments (Sharing Rate applies). Group Offer also applies to Group of 8 persons sharing 4x2-bedroom apartments (Single Rate applies). Booking Terms: Airport Transfers valid for Murcia Airport. Transfers for Alicante Airport provided on request. Offer Conditions: Group Offer is not combinable with any other Group offer or discount. Evening Dinner is served at Fontana Di Pietra (Italian Restaurant) & Oliva Steakhouse. Ascot Golf offers Groups of 4+ at Mar Menor Residences FREE Airport & Golf Transfers. Offer Conditions: Minimum stay 4 nights. 4-Ball Offer may not be combined with any other Group Discount. Listed Package Prices: Listed golf package prices apply with FREE Airport & Golf Transfers. Golfers at Mar Menor enjoy a fantastic choice of 6 resort golf courses. Upgrade your package to Unlimited Golf for optional daily supplement. Booking Terms: Supplement payable per person/day to upgrade to Unlimited Golf. Offer Conditions: Unlimited Golf supplement may apply on a preferred number of days and does not need to be applied on each day of your package. Listed Package Prices: Listed Golf Packages apply with a daily supplement payable for optional upgrade to Unlimited Golf. PGA Pro Stays & Plays for FREE on the same basis. Offer Conditions: Price for single occupancy, extended stays available on request. These luxury apartments leave no details to chance, They have a beautiful and bright living room, fully furnished with modern and comfortable furniture. Fully equipped kitchen and full bathroom, 1 or 2 bedrooms, terrace or garden, communal swimming pool, all of them overlooking the golf course and beautiful lakes. El Olivo – Enjoy a steak in this classic steak house within Mar Menor Village. La Fontana Di Pietra - Offering traditional Italian dishes with a modern twist. Enjoy a great variety of delicious pasta and pizzas cooked slowly in the oven. Located in Mar Menor Village. Nomad – Enjoy Mediterranean cuisine from the most traditional to the best Haut Cuisine. Dine inside of Al Fresco by the swimming pool. Nomad serves Breakfast, Lunch & Dinner. Located in InterContinental Mar Menor Hotel. Mizu Japanese restaurant – Enjoy delicious sushi. Open Wednesday – Sunday. Located in the InterContinental Mar Menor Hotel. The Club House – Enjoy daily breakfast while overlooking Mar Menor’s 1st & 18th hole. Refreshing drinks and snacks are served throughout the day. The Clover Irish Golf Tavern – This traditional Irish pub is decorated with paintings, pictures and comic strips about the game of golf. Enjoy your favourite drink while discussing the ups and downs of your round. Guests of Mar Menor Residences enjoy full access to the Intercontinental Mar Menor Leisure and dining facilities. 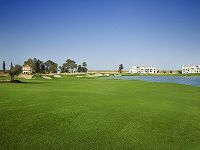 Mar Menor Golf Resort is just 1 hour from Alicante and 15 minutes from Murcia Airport.